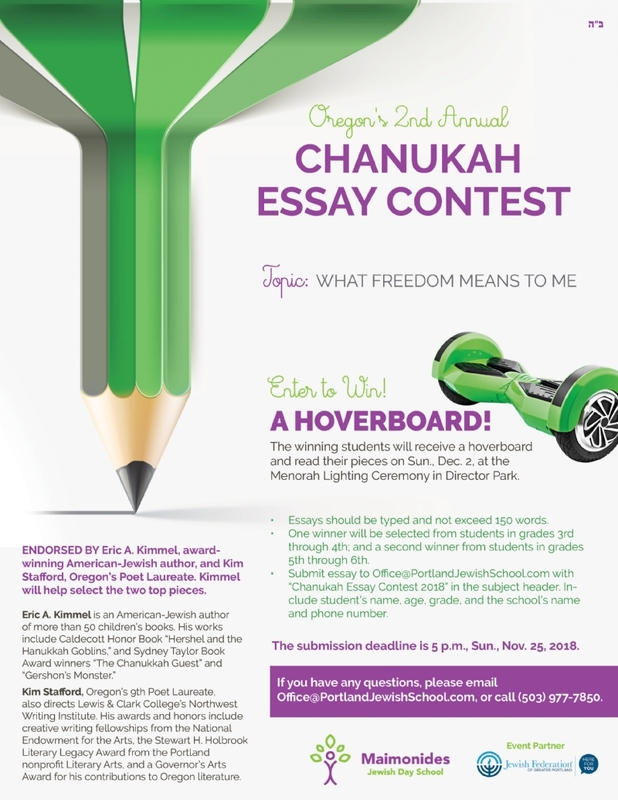 Enjoy articles and a video about Maimonides' essay contest and Chabad's Menorah Lighting event in The Oregonian and Oregon Jewish Life magazine , and click here to view a video of the full event . 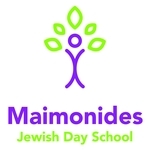 Dozens of 3rd through 6th graders — from the three Jewish day schools in Portland, all the way to Yujin Gakuen School in Eugene — wrote up to 150 words each on “What Freedom Means to Me.” The students’ responses were very impressive and wide-ranging. 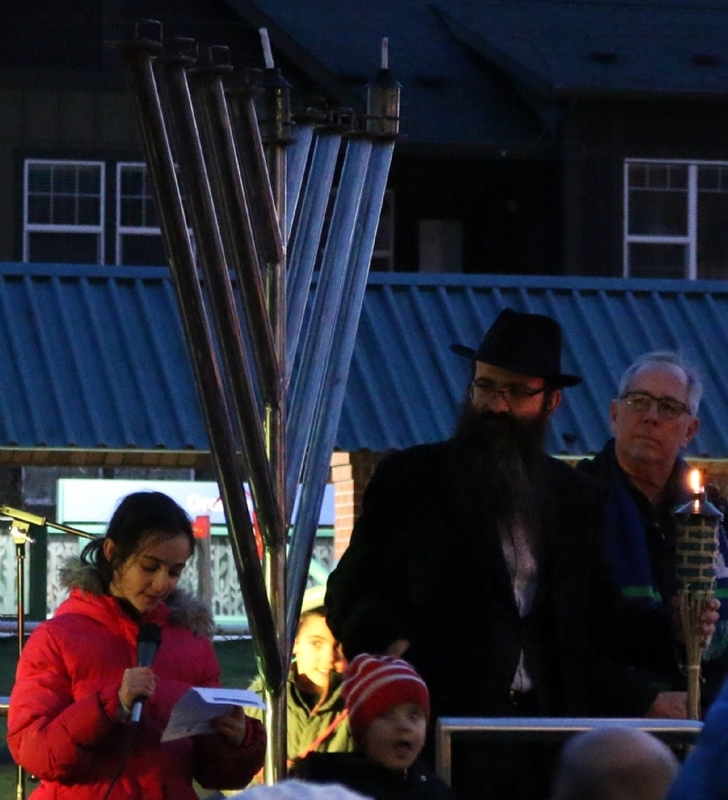 Their reflections included the story of Chanukah itself, slavery versus freedom, free thinking versus chained wrists, love of family, great food, and, of course, exciting presents. 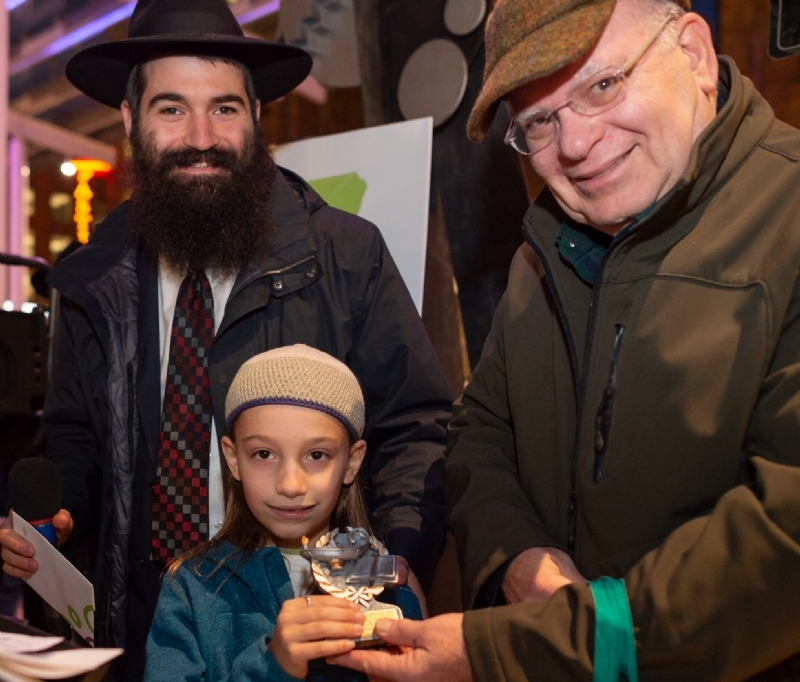 This year’s winners are Reuben Lev, a 3rd grader at Portland Jewish Academy, and Yehudis Rivkin, a 5th grader at Maimonides Jewish Day School. Freedom means not just being free in your mind and body but being free in your heart and soul. Freedom means being a good person from your heart to yourself and other people. Freedom means people being happy from the soul because they have been freed from slavery. When I think of this I think about people in the desert laughing and drinking wine and children playing games. Freedom means a free ocean with no plastic on the sand or in the water — just normal ocean with waves. When people are free God is happy. If people are not free the earth is not happy. If freedom means doing everything you want to do, then anything you do will make you unfree from something. What freedom means to me is not action but being able to think, feel, and believe. Nobody can take that away from you even if you are in the worst situation possible. You have the freedom to think, feel, and believe freely. Even if there are chains on your hands and feet, you have the freedom to feel in your heart, think in your brain, and believe freely, notions nobody can ever take away from you. This freedom will stay forever.